I’ve always wanted to find a four-leaf clover. My dog Basil and I have searched through countless clumps of clover over the years. We’ve looked in the local dog park, the woods, and we even look at stray patches of clover along the sidewalks. No luck. But the day I find one, I’ll waste no time putting it on the blog for all to see. Since St. Patrick’s Day is approaching, I thought I’d share with you the history of the elusive four-leaf clover, along with some fun facts. Enjoy! Most people associate the four-leaf clover with Ireland and the celebration of St. Patrick’s Day. However, this symbol has appeared in writings throughout history. In fact, some believe that the four-leaf clover played a part in the biblical story of Adam and Eve. Eve is thought to have picked a four-leaf clover from the Garden of Eden to remind her of that place. Through the centuries, the four-leaf clover has been connected with good fortune and luck. It was also believed to be a symbol that protected people from magic spells and bad omens. In the Middle ages, children in Ireland thought that finding a four-leaf clover would allow them to catch sight of fairies flying all around them. 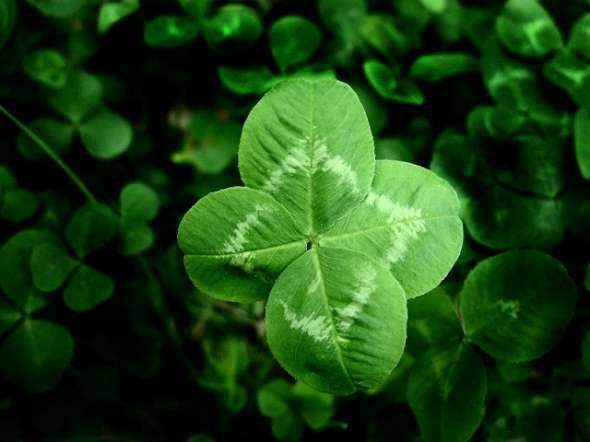 The four leaves of the clover are said to represent hope, faith, love, and luck. Finding a four-leaf clover has always been a tremendous task, as I know all too well. 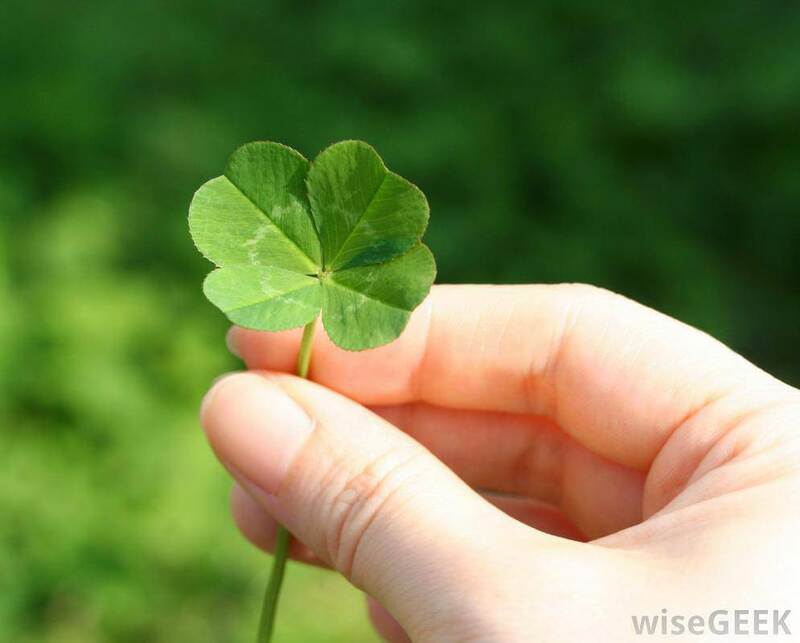 In fact, one in ten thousand pieces of clover has four leaves instead of three. No wonder it’s considered such a lucky find! Take a quick glance at a gathering of clover and you’ll see tons of stems with three leaves. One tip to remember when looking for a four-leaf clover is to conduct your search in the late summer months. The four-leaf clover is a mutation of a three-leaf clover. Sometimes this genetic quirk can even cause a stalk of clover to grow five leaves. Four-leaf clovers are more plentiful in late summer because they’ve had more time to grow and produce more mutations. This increases your odds of finding one. Another tip for finding a four-leaf clover is to look at a clump of clover from a distance instead of inspecting it at ground level. Sometimes getting too close to the ground doesn’t allow you to see the different types. Gently pushing the clover around with your foot helps you to spot one that is different from the rest. If you happen to find a four-leaf clover, look at the ones all around it. Mutations of clover tend to grow in close vicinity to one another. In addition, when you’re searching for large clumps of clover, look in an area that receives at least four hours of direct sunlight per day. Clover doesn’t grow well in the consuming shade of a tree or a bush. The larger the gathering, the more chance you’ll have of finding what you’re looking for!